Marrows ~ what on earth do you do with them? They are pretty much flavourless, and only really work if you stuff them with a highly flavoured and spiced meat and vegetable mix. Which I’ve tried and am not in a rush to repeat. They seem purely to exist as a vehicle for other flavours. So what to do with a large bag of homegrown salads and veggies that a friend gave me that included a couple of marrows? Hit him with them, was my first idea, second was to bin them. But then curiosity got the better of me and I started to have a flick through my cookbooks. I’m not a fan, nor are many others including Sophie Grigson, so I’m in good company. In her “Vegetable Bible” she tickled my interest with a recipe for Marrows, ginger and cardamom preserve. 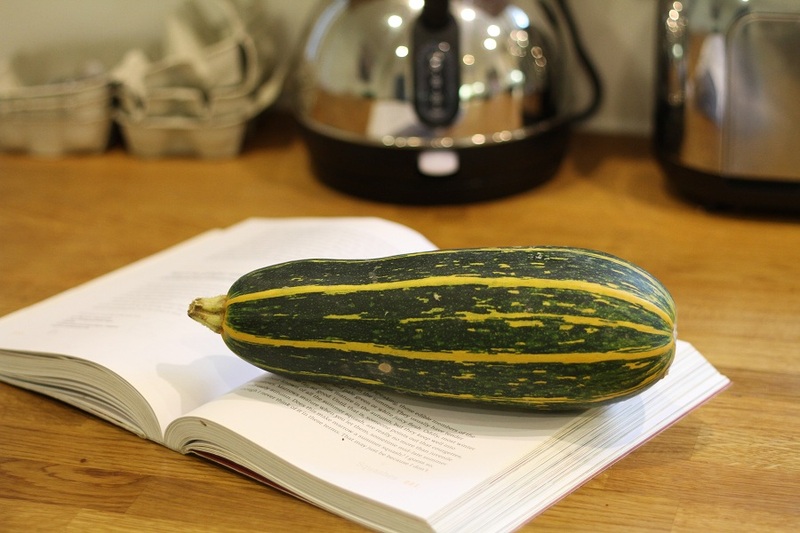 Grigson describes it as the best thing you can do with a marrow ~ high praise indeed! With the zest and juice of lemon, the “tingle” of ginger and the fragrance of cardamom it works a treat. It is a preserve not a jam, it doesn’t set, so don’t even bother trying to get it to a setting point. Grigson says it makes about 7 x 450g or 1 lb jam jars, but I found it to be much less. The joy of cooking this conserve is the aroma. The kitchen filled with Lemon and Ginger. Bliss. Peel the marrows and remove the seeds. Cut into small chunks (2cm / 3/4 inch). 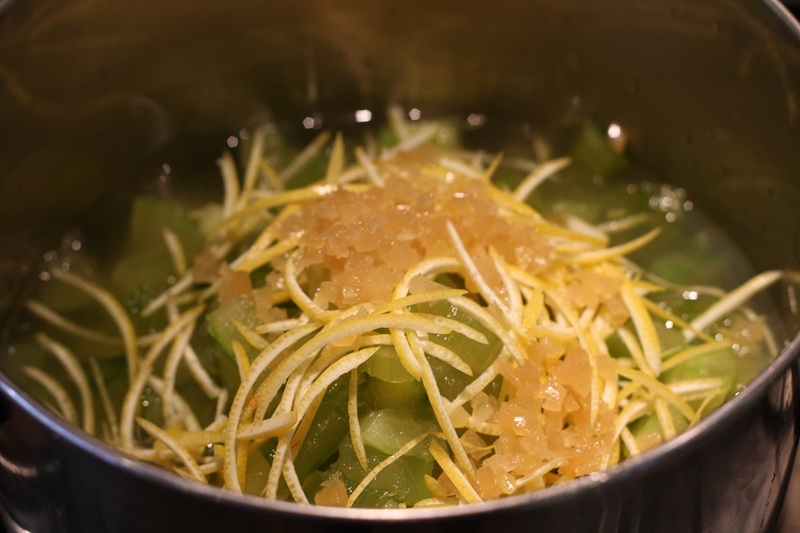 Place the marrow chunks in a pan of boiling water and simmer for 3 minutes. Drain and rinse under the cold tap, and leave to drain thoroughly. 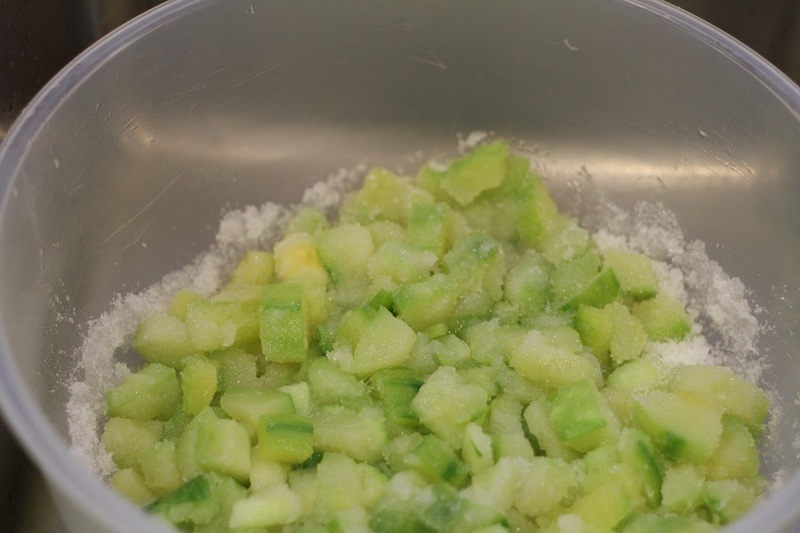 Now layer the marrow with the sugar in a large bowl, cover with a tea-towel and leave overnight. 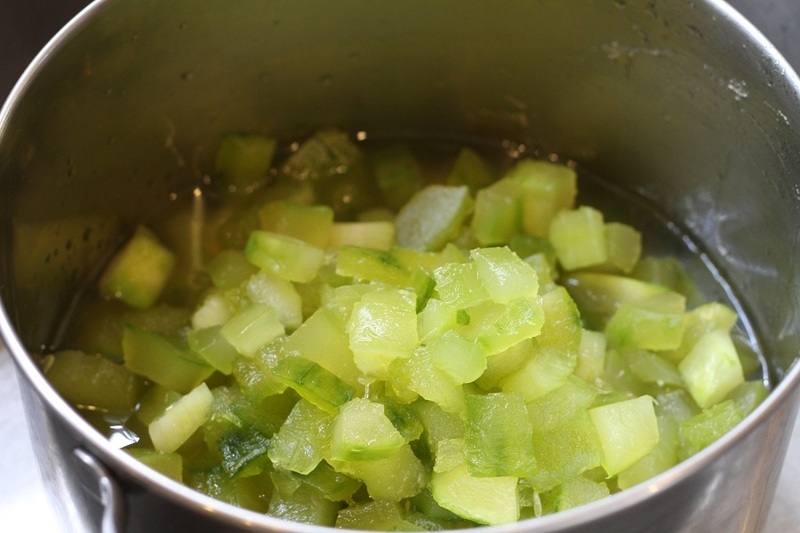 Next day, scrape the sugar, marrow and juices into a large preserving pan. 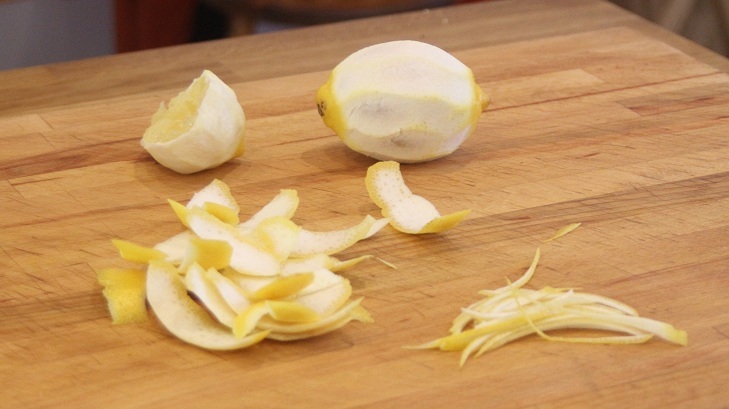 Pare off the zest of the lemons into thin strips, then shred finely. Add the lemon peel to the pan together with juice of the lemons. Add the ginger and cardamom. Stir over a low heat until the sugar has completely dissolved. Bring to the boil, reduce the heat and simmer until the marrow becomes translucent and the syrup is thick. The preserve is ready when the marrow become glassy and the syrup is thick. There is no exact cooking time given in the original recipe. From my making it, I’d say about an hour on a low heat, simmering with regular stirring. As with all “jams” it suddenly goes to the consistency you are looking for – thick, and in this case, clear and gloopy. Note that the marrow doesn’t break down completely (as I was expecting it to do). 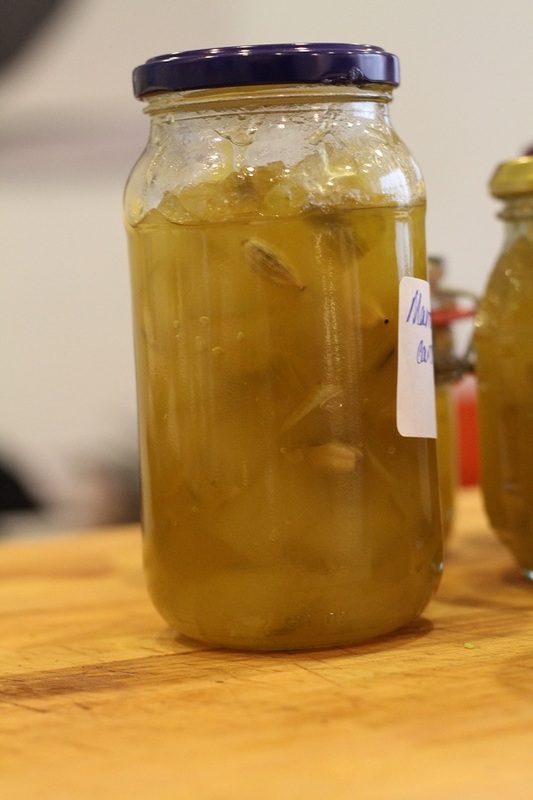 Take off the heat and pour into sterilised jars and seal tightly. So to answer my original question “Marrows ~ what on earth do you do with them?” make Jam! I don’t grow marrows. But I’m happy if once a year I’m given 2 of them to make this lovely conserve. Next Post Next post: Aubergines YES, YES, YES! 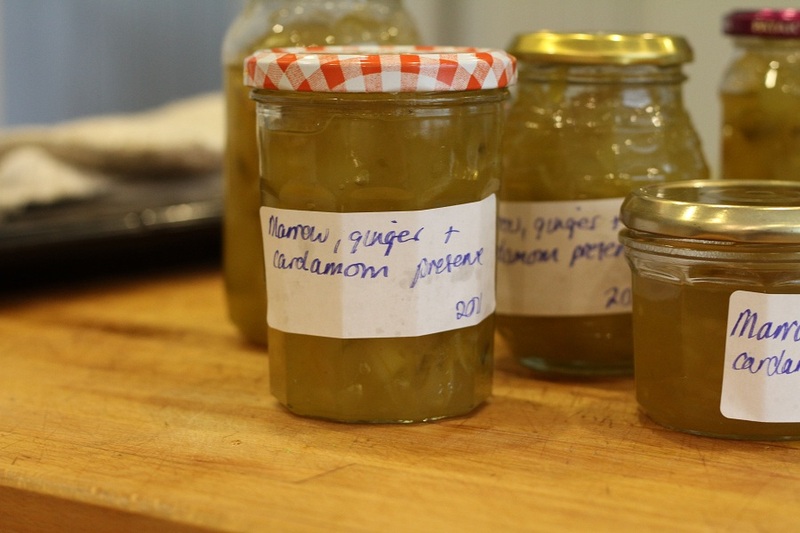 I make Marrow and ginger jam using Certo (liquid pectin), with that you can get a reasonable set; it isn’t an exact science like other jams but I have to say it is one of my favourite preserves. I don’t grow marrows here in Italy so I usually let a courgette get huge and use that. Thanks for deciding to follow me. Hi Christina, I haven’t heard of liquid pectin before now so I will have to find out more about it, Thank you, and thanks for popping into the promenade !